Bonjour! Today I am popping in to talk about one of my FAVOURITE activities to get started with right away in maternelle - directed drawing! 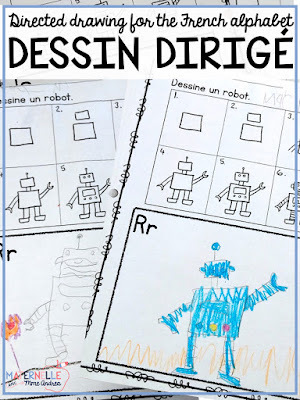 I start with directed drawing pretty much from the first full week of maternelle. I LOVE routine (and so do my students! ), and this is one of the first academic activities I start building into our day each year. I have another blog post coming next week with my best tips for directed drawing, but I wanted to take some time to first go over why I think you should give it a try in your classroom. There are many benefits that come from directed drawing - it is not "fluff" or a filler activity. Every single year that I do directed drawing, my students are AMAZED at what they can create when they try thoughtful, multi-step drawings. Almost every student ends up being much better at drawing than they thought, simply because no one has ever showed them how to take their time, think about each part of what they want to draw, and add details. I get so excited to show my students what they are capable of! I build directed drawing into our alphabet routine. I use these directed drawing sheets, where we draw one thing for each letter. What we draw is also the exact same anchor word that we have on our alphabet posters. Consistency is key to help your students anchor letter sounds to letters! Also, we all know that students learn in different ways - drawing something that begins with the target letter of the day or week may help some of your students really remember their letter names and sounds. You could also use it for other academic concepts - like learning to draw vocabulary words or words from your thematic word wall. We all know that we are role models all day, every day when we are teachers. 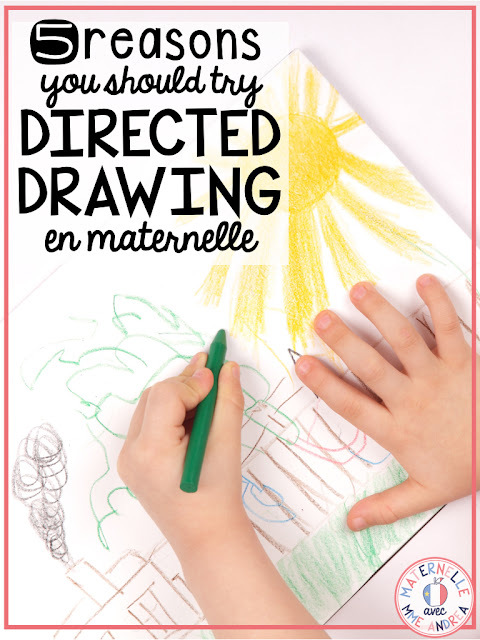 But, directed drawing really gives you the chance to teach your students skills that are CRUCIAL for being successful in maternelle (and in life)... and no, not drawing skills. Directed drawing allows you to model taking risks, making mistakes, and doing your best. I am NOT an artist - far from it. Are my drawings perfect? Definitely not!!! And even if you are an artist, I'm willing to be that when you are in front of 20 students, drawing while simultaneously making sure no one is picking their nose, everyone has their shirt on, and no one is eating their pencil, your drawings probably won't be perfect either. Take the opportunity to show your students what to do if you mess up. Let them know that it's totally fine. Explain how everyone's drawings are different, and if you want to get better, all you have to do is practice. Celebrate every single drawing and drawing attempt. These are some of the most important lessons that your little students can learn from you! As I said above, if you want to get better at something, all you have to do is practice. And, adding five minutes of multi-step drawing practice to your routine every day is pretty much guaranteed to help your students improve. Directed drawing builds fine motor skills and helps our munchkins learn to hold and control a pencil. They learn that everything we want to draw is made up of shapes and lines, and they will get better at drawing these shapes and lines. Their spatial awareness will improve and they will understand more French vocabulary as you both tell them and show them where to put their pencil. Every year, I see my students transfer what they learn during directed drawing to other areas, especially writing. I always teach them to add a setting during our drawings, and I better not see anything except astronauts floating in space... and then I see them then go and add settings in their stories later in the day, on their own. Even during free play, my students who choose to draw will usually do multi-step, detailed drawings. It's fantastic! After we master our alphabet drawings, we move into bigger art projects. 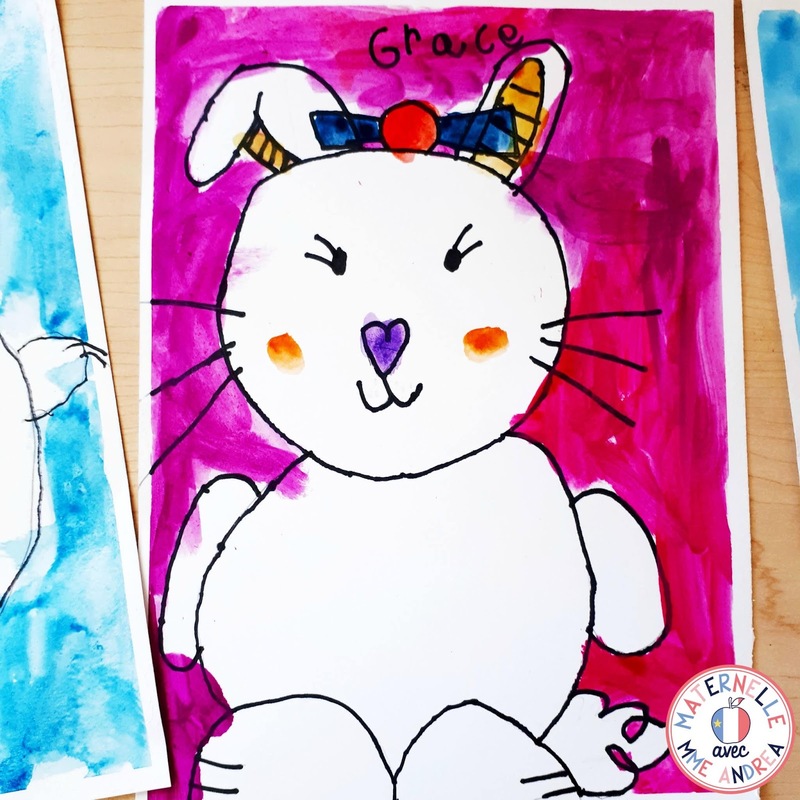 Check out these bunnies we did last year! Okay, this one is kind of fluffy :) But, directed drawing is fun. 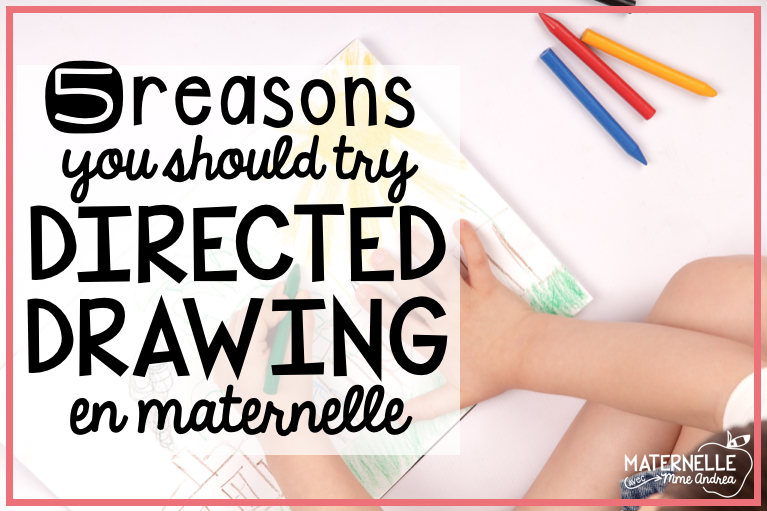 And we love fun in maternelle - especially when it helps with a million other things, too! So, are you convinced to give it a try this year? I hope so! If yes, check back next week - I will be sharing my best tips to help make sure directed drawing runs smoothly for you.